China has installed another Catholic bishop in a move that is likely to increase tension with the Vatican. Zhan Silu was elevated to become bishop of Mindong Diocese in eastern Fujian province on Sunday without the approval of the Holy See. In the past fortnight Beijing has consecrated two other unapproved bishops, sparking Papal criticism. 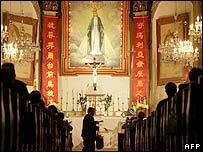 China has both a state-run Catholic association and an underground church loyal to the Vatican. The recent appointments have cast a shadow on moves to re-establish diplomatic relations that were severed more than 50 years ago. Zhan Silu, 45, was consecrated as bishop in 2000 but had been serving as a deputy to another who died last year and - until Sunday - had not celebrated a full Mass as bishop. Priests in both China churches say his elevation could increase tension with the Vatican. The Vatican recently threatened to excommunicate two bishops consecrated by China's official church. Pope Benedict XVI expressed his "deep displeasure" over the appointments. The Chinese government does not recognise the Vatican's power to appoint bishops but over the past five years has allowed bishops to seek Vatican approval. However, the unilateral consecration of the two bishops in eastern Anhui province and south-western Yunnan has seen ties sour. There are an estimated 13 million Catholics in China, of whom about five million follow the Chinese Catholic Patriotic Association and the remainder the underground church. China has said it would like better relations with the Vatican, but wants the Holy See to cut its diplomatic links with Taiwan first. Diplomatic ties were severed in 1951 after the 1949 Communist takeover in China and subsequent crackdown on religion.